Summer is nearly over. How did it go by so quickly? Now that we are past Labor Day, it is time to plan this year’s Christmas display. There are a number of considerations and I would like to address what we consider are the five most important. Is the focus religious or secular or both? With the modern holiday celebration of Christmas it is easy to forget that it evolved as a Christian holiday celebrating the birth of Jesus Christ. Many Christians consider it very important to make this statement by displaying a Nativity Scene or Creche. Many people also view Christmas as a holiday for children, so the Santa, Snowman, Nutcracker or Toy Soldier have become an important part of the non-religious Christmas mythology. Is your display to be indoor or outdoor, or both? Of course, much of the Christmas ritual is centered on the Christmas tree with all of the traditional decorations and accessories and the family traditions that go along with it. Many religious people have replaced some or all of the baubles and tree skirts and, in some cases, even the tree, with an indoor Nativity Scene. Out door displays whether a Nativity creche or a Nutcracker, need to be large enough to be visible and are usually spotlighted. Here, location is important, if they are to be seen on the street. Where and how are you going to store your Christmas display? Some displays are lighted wire shapes which fold flat and are easily stored, standing up against a wall or lying down. The same storage convenience applies to the painted wood panel 2D Nativity figures and sets. The three dimensional fiber glass or resin mix Nativity or other Christmas statues will require some prior planning for off season storage.If convenient, we recommend that you store these pieces in the carton or crate they were shipped in. These can be stored in a garage, attic, warehouse or annex that is dry and safe. If there isn’t room to use the original boxes, the individual pieces can be wrapped in bubble wrap and laid flat on the floor and on top of each other, up to a safe height. Resin and fabric figures should always be stored in the original carton in a dry area. 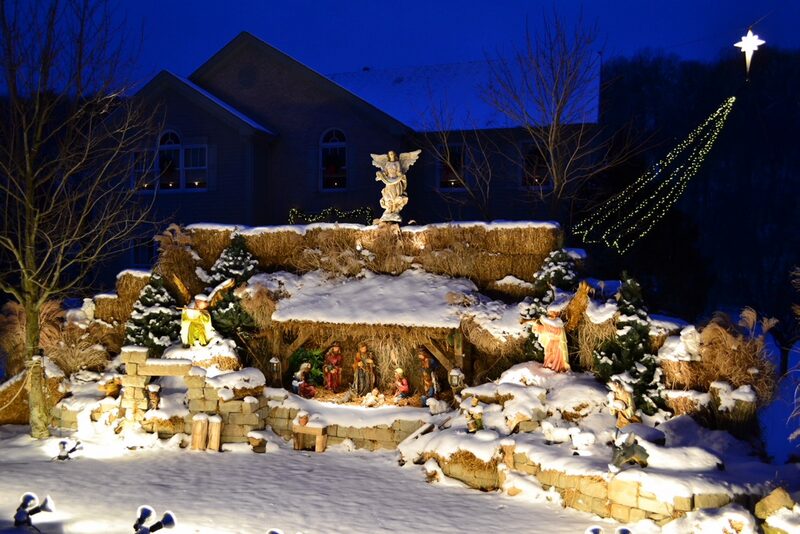 How are you going to keep your Christmas display safe and secure? On our website under the heading “Useful Information” we offer a number of suggestions about securing your outdoor Nativity and other Christmas statues and displays. These include tethering, attaching or otherwise connecting the statue to something immovable, like the ground. Indoor displays should be set up away from fireplaces or hot electric lights. The last consideration is your budget. You will want to view this kind of purchase as an investment. Our fiberglass and polyresin pieces are not yesterday’s cheap throwaway plastic figures lighted from the inside or the soft vinyl blow ups which wilt overnight. With proper cleaning and storage they will last you a long time. Whatever your budget, don’t for get to include the cost of shipping/delivery for your item or set. These are our five key factors. What are yours? Please let us know and, for the best submission, as determined by us, we will give $100.00 off the price of any of our items which sell for $1200.00 or more.